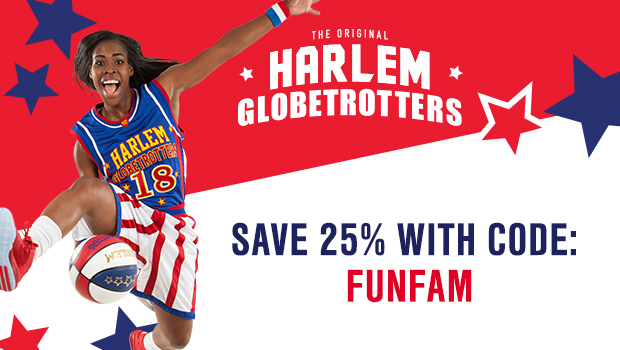 Save 25% Off Your Harlem Globetrotters Tickets! I am so excited to bring my family to see the Harlem Globetrotters in Hershey, PA at the end of this month! We have been wanting to see them play for a while now. So, we will be spending out 7th anniversary weekend in Hershey seeing the Harlem Globetrotters! Stay tuned, because I will be posting during and after the show. I will highlight our fun trip to all of you when we get back! Hey! Do you have cute kitties at home and love to spoil them? I have two! A Siamese/tabby mix and a tuxedo kitty. I came across KitNipBox, a subscription box for cats and I knew that my kitties would love it! Sure enough, they did! Most of the time they don't play with toys. One likes to play with twist ties and the other likes playing with Legos. To my surprise, both of them have been playing non stop with the toys inside the KitNipBox ever since I opened it! 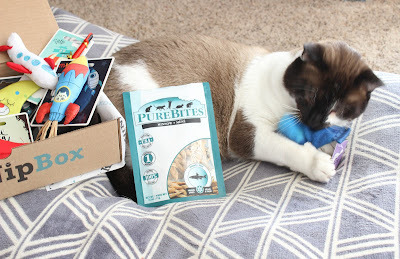 What was inside our KitNipBox?? All For Paws Airplane Wand- This is Puma's favorite toy. My sons love him with it and they love how he bites and chews the airplane on the end. MAX Crescent Moon Toss Toy- Is definitely fun to toss. Molly likes laying on this one. It has a strong cat nip smell! Kitty Felt Cardinal- This toy is my personal favorite. I love bright red cardinals! My kitties love the black tail feathers! MAX Rocket Ship- I love the stray pieces that are hanging of the bottom of this cute rocket ship. So did my kitties! I love how bright and colorful this toy is! All For Paws Cloud Pillow- I love this cute cloud pillow. Its super soft. Molly uses it as her pillow on her cat bed! PureBites Freeze Dried Small Minnows- Molly loved these freeze dried minnows! Perfect treat for my sweet kitties! Keeping our kitties happy and busy is sometimes tough. I am not going to lie, its tough to find toys that they will actually play with! This subscription box was a home run! They loved everything inside! I am a happy kitty mom not only for the fact that they love the goodies, but because the toys are made very well. They have been playing and chewing on them for about 2 weeks now, and the toys are still in really good shape! Just a fee teeth holes here and there. 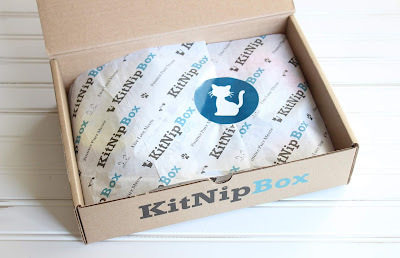 :) KitNipBox is highly recommended by me. It's the best cat box I've seen! A portion of processed are donated to animal welfare causes. Even more of a reason to sign up! Use code SAMPLINGBEE to save 15% off! Hey! Sleek Treat is one of my favorite snack subscription boxes. It's one of my favorites because all of the snacks inside contain low sugar or no sugar at all! January's Power Up box contained 8 different brands. 12 snacks in total. Sleek Treat is a monthly subscription box that contains new and excited snacks each month. Their boxes are great for everyone! See what's inside of January's Power UP box below! The Bhu Foods Chocolate Chip Protein Cookie was good, but when I opened up the package, the cookie was in pieces. As I was trying it, it was just crumbling in my fingers. BUT, this is a great flavorful protein cookie. I can definitely taste the protein in it. Probably because it contains 10 grams! Which is awesome. Bhu Foods' Protein Cookie has no sugar and it is a great snack to enjoy before or after a workout. Coupon: SleekBhu for 10% off your order. The Good Chocolate is very good chocolates. I love how dark the chocolate is. It's almost so dark that its bitter. But, definitely in a good way. The yummy ingredients added into the chocolate really balances out the flavor. The trio included Mint, Himalayan Salt and Signature Dark. I really enjoyed the Himalayan Salt. I love The Good Chocolate chocolates because they are low calorie, contain no sugar, they are handmade and they help prevent cavities! Coupon: #TGCsleektreatFEB19 for 15% your order. Noosh Almond Butter is my favorite almond butter. The flavors that they have are amazing! January's box contained a trio of flavors: Original, Chocolate and Birthday Cake. The Birthday Cake is definitely my favorite. Noosh's Almond Butters are so good that I eat them right out of the package! The almond butters are smooth and silky and contain less than 1 gram of sugar. Coupon: SleektreatXNoosh for 15% off your order. The Gorilly Goods Hillside Trail Mix was okay. I love pumpkin seeds but the seasoning on them was a bit overbearing for me. The pumpkin seeds were fresh and crunchy. I would love to try another flavor of trail mix from Gorilly Goods. Their trail mixes have absolutely no sugar. Coupon: SLEEKTREAT for 20% off your order. Just The Cheese Crunchy Mini Toasted Cheese snack is so good! These mini toasted cheeses are super crunchy and flavorful. They are made with 100% all natural Wisconsin Cheese and have no sugar. I skip the potato chips and grab a bag of these! Coupon: SLEEKTREAT for 10% off your order. Vitalize Mints in Sour Cherry are made with 100% Xylitol. These little light pink mints really pack a punch. Not only do they taste good, but they help remove bad breath caused from stinky foods. I love the sour cherry flavor. Coupon: SLEEKTREAT15 for 15% off your order + free shipping. Nuti Light To-Go Hazelnut Spread is made with dark chocolate. This spread has no sugar in it. It is sweetened with Stevia, Chicory Root Fiber and Erythritol. I am all for hazelnut spreads and this one is very good. I love its smooth, creamy texture. Goes so well with pretzels but I like to eat it with a spoon! Coupon: sleektreat for 15% off your order. Grenade Birthday Cake Protein Bars are loaded with 20 grams of protein. Each bar contains only 2 grams of sugar. This is a protein bar that I will actually eat. It's flavors are a home run in my book. I mean, who doesn't love birthday cake?? Grenade's protein bars are soft, chewy and they are big! Enough to keep my belly full for hours! Love the added sprinkles on the tops of these! My favorite snack this month was definitely the Noosh Almond Butters. I really love them, a lot! It's amazing how Sleek Treat can fit so many delicious snacks into one small box! The snack in January's box was one of my favorites. Sleek Treat really does an amazing job finding snacks for their boxes. It was great to see that almost all of the brands supplied special $$ off coupon codes! Sleek Treat is having a special sale this month! Get 35% off a 3 month subscription. Use code VDAY19 at sleektreat.com! Coupon expires 2/15/19. Hey there! Happy February! I am so glad that January is over. Is it only me, or does January seem to have 100 days? But, January did have a lot of good days to it. Not only is it fun to start a new year, January is also mine and my youngest son's birthday month. Another great part of January was the January Degusta Box USA! This box was loaded with goodies. I wanted to try something a bit different this month. So, I decided to take the product of the month and use it in a recipe. This month's product of the month was La Tortilla Factory's Low Carb Flour Tortillas! 1. Add tuna fish, mayonnaise and pepper into a bowl and stir until combined. 2. Lay out 2 La Tortilla Factory Tortillas on a flat surface. 3. Assemble your wraps by layering carrots, lettuce and tuna fish down the middles of your tortillas. 4. Roll up your wraps by starting at one end. Fold wrap over ingredients and roll up snugly. Cut the wrap in half. January's Degusta Box USA contained several other products. A lot of them were brand new to me. I really enjoyed the hot sauce (I made a buffalo chicken dip with it!! ), the tortillas and the strawberry pillow cereal. All-in-all, this was a great box. I had a lot of fun making an easy recipe. I love tuna wraps! Great mixture of products, Degusta Box! Degusta Box USA is only $19.99 a month. SUBSCRIBE today!